May 16, 2012 - THERE ARE baseball announcers, including some very good ones. 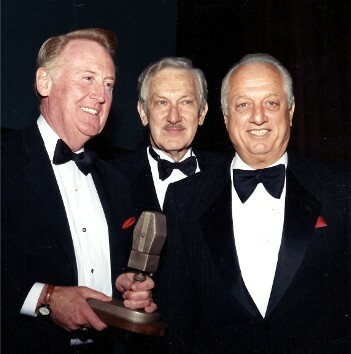 And then there is Vin Scully. Some fans around New York may not fully realize this, since the last game he called for a New York franchise was on Sept. 29, 1957. The Brooklyn Dodgers lost that game, and Brooklyn lost the Dodgers. For the last 55 years, Scully has called games for the Los Angeles Dodgers, one of the last living and working links to the team that was. But up at Fordham, where Scully went to school and worked at a fledgling FM radio station called WFUV, they haven’t forgotten. At WFUV’S annual fund-raising gala on May 10th, the Vin Scully Lifetime Achievement Award in sports broadcasting was presented to another pretty fair sportscaster, Al Michaels. Christiane Amanpour received the Charles Osgood Lifetime Achievement Award for broadcast journalism, Michael Dorf received the first Community Service Award, and Chris Isaak was honored as artist of the year. Isaak performed, along with Citizen Cope, the Kennedys the Roches and others. Scully, who at 84 has cut back on his traveling and won’t attend, says he’s nonetheless flattered and surprised he has this namesake award. He did know, however, what kind of job he wanted. At Fordham, where he played center field, he also did some writing. But when WFUV came along, that was that. His first radio job, at WTOP in Washington, was another exercise in doing a lot of everything. But a visit to CBS Radio in New York led him to baseball broadcaster Red Barber, who introduced him to Dodgers owner Branch Rickey. He put Scully on the radio with Barber in 1950. Scully has been at the mic ever since, from World Series wins to perfect games to Hank Aaron’s 715th home run to ordinary games in Pittsburgh in August. As a kid growing up on 175th St., he recalls, he used to run 20 blocks down to the Polo Grounds, where he could get a free Catholic Youth Organization seat or buy a 55-cent ticket by redeeming empty soda bottles.